and link up, its time to shine. A few years ago I decided that it was easier to pick up a key ring when I traveled somewhere then to bring home bunch of other stuff. My friend Nancy's husband travels a bunch so he picked me up a few, and when they took a cruise they picked me up a few more. I found this great frame with a wooden backing instead of cardboard. Found it next to my daughters trash can to go out with the trash.... I could not have that.... I had a plan. It worked out perfect and I still have room for more! First, I think I will start with the one project that I did today...although it was inspired yesterday, or last night when my mind just kept running.. 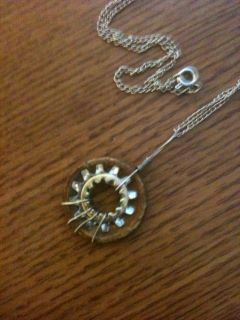 The base part of the necklace came from a broken lamp. The center part from Ace Hardware in the hardware section and the top part I am not really sure...It must have fallen off something I was taking apart cause I found it on the craftroom floor. I must admit, I borrow ideas form other blogs or now my new found love PINTEREST. On Pinterest they had 3 baskets. One with the wash clothes, one with hand towels and one larger one for bath towels. My space was limited so I did not put up the larger one for the bath towels. I also borrowed this from Pinterest. Only I have seen them done in spoons and forks. Several hung together. I had to add my own touch and stencil the ivy on the side of mine. Last year after Christmas I ran across a really pretty lamp at Fred's. I walked away a couple of times but I kept going back. I had plans for that lamp. The socket part where you put the bulb was broken so it was marked down. Originally $24.99 and I got it for $5.00. 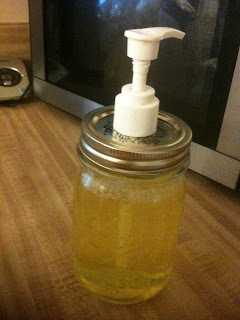 My friend Gail and My Repurposed Life http://www.myrepurposedlife.net/ would be proud of my $5.00 buy! Now according to the price tag I would have paid even more then $24.99 for it some where else. I cut the cord!! And decided I was not going to try and fix the socket instead I had a plan to make it a beautiful candleholder with my brother Ray's house in mind. But I had to look for a whole year for the right globe to attach to it. Last weekend I visited the Rehab Store and found what I thought would work great. And here is the lamp. Love the detail. Hope my brother and sis in law like it. Just ignore the dust on it! 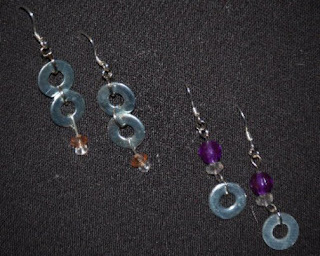 Back sometime ago I played around with making necklaces and earrings using washers. Thanks to PINTEREST I have a renewed desire to work with HARDWARE again! Wonder what I will find to make next? 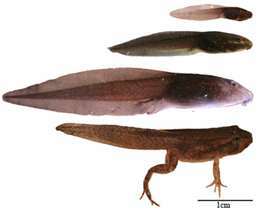 Years ago when my son was younger (he is 24 now) my friends mother had a pond in her yard, and this pond had tadpoles in it. Cory wanted to watch a tadpole turn to a frog. Sounded like a great idea..... We caught a few and a couple did not make it but we had one left. Our tadpole changed into a frog nicely. and let him go in the creek that ran next to the house. the deck....only the sun moved. And this is about how he looked.......legs thrown to the side and belly up. Today has been a long and tiring day. I met Theresa (friend) at the fitness center at 6am this morning.....my day off and I was working out at 6am. From there we grabbed some eggs and coffee. From there I went to Wally World to pick up some paint so I could go to my daughters house to paint the baby boys room. But between Wally World and the painting I had time to drill a hold in the top of a Ball Jar that I picked up at Goodwill for .49 cents. Winter can be so boring for a photographer....unless you open your eyes and look around. The colors might be a bit dull but there is beauty in so many things. I have been messing with beads making necklaces and earrings for a long time, but I decided that I needed to take it up a level. A friend, Starla showed me some of her work with beads and wire. That just added the taste to my mouth! The earrings are over 50 years old. My Dad brought them back from Japan for my Mom. She recently gave them to me but I have piereced ears and these had the screw on type. I just removed them and added the wires for pierced ears. I wore them to work the other day and everyone loved them, but I felt that there was something not right.... I needed a necklace! Off to Hobby Lobby. 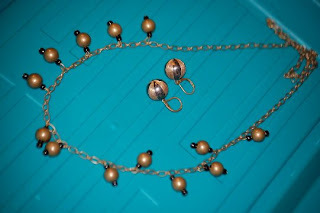 I got the chain and the bronzed color beads, and to work I went. I had the black beads. But the above necklace is what I turned out, pretty good match I think. Now to the NEW level! I have been house sitting for my brother for years esp. during the years that my nephew was traveling all over racing. But I have to say my adventures of house sitting this time for my brother was a bit more then I could really handle. I think part of that has to do with the fact that I am becoming a “home body”! I like being home, I like my company….and of course, The KING’s company (my dog, Dakota). I love to go out with friends but I also like coming home to my place. So I was stressing just a bit about just being at his house and away from my comfort zone. But the other fact is that nothing seemed to go right. If you want to really understand part of the “FUN” time I had, go to http://pam-lifethroughmyeyes.blogspot.com/2012/01/house-sitting-with-tj-bird.html and read this post. Should have titled it the battle with the bird! a PROMISE to work on my blogging! Now, why would I go and do something like this? One…. This past week I have been away from my home and I have been house/dog/bird and horse sitting for my brother Ray. Ray only lives about 25 minutes from me but he is out in the country where I love to take my camera and enjoy the sights. The first day out, last Sunday, Jan.,1, 2012 I headed to my brothers home. After turning on his road and heading to his house, I had to stop and let a group of Wild Turkey cross the road. Yes, you heard me correctly... WILD TURKEY. This is just some of them, there were about 15 or so. You see the curve up the road from the turkey? When I made it to that spot I had to stop once again to let four deer cross in front of me. These two animals were two of the ones I was caring for. The white one is Jack and the brown is Misfire. Beautiful aren't they? Meet Peanut. So sweet. Peanut is known by my younger brother, Mark as "My Little Pony with the Tina Turner Hair".